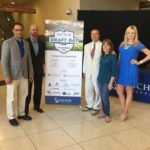 The Monson Law Firm attended the Acadiana Chapter of Professional Insurance Agents 2016 Annual Crawfish Boil at Warehouse Five Three Five in Lafayette. It was a fun night of networking, while enjoying delicious crawfish with our fellow PIA members! Pictured are Ann’Lee Earles, Marketing Director of The Monson Law Firm, Debbie Harrington, Field Agency Manger with Maison Insurance Company and Marianne Parker-Brown, Assistant Vice President of Claims with Maison Insurance Company. Click here to view pictures! The Monson Law Firm was a Silver Sponsor of the Anchor Insurance Conference held in Jacksonville, Florida earlier this week. We enjoyed a day of continuing education followed by enjoying a Jacksonville Sharks Arena Football game! Pictured are Darryn Melerine and Jason Beasley with MD Claims Group, Matthew Monson, Esq., Leona Liskovec with Anchor Insurance and Ann’Lee Earles, CPIA. Click here to view pictures! 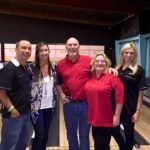 The Monson Law Firm attended the Independent Insurance Agents of Louisiana’s “Make A Wish” bowl-a-thon. Funds raised at the bowl-a-thon went to grant the following wishes: Tristen (Hodgkin lymphoma) – 8 years old from Bastrop wants to go to Disney World. Christian (Malignant neoplasm of nervous system, cranial nerves) – 8 years old from Covington wants to go to Disney World. Navada (Large cell lymphoma)- 16 years old from St. Francisville wants to go to Ireland. If you would like to make a donation to the “Make A Wish” Foundation, you can do so at www.wish.org. Pictured are Matthew Monson, Esq., Baylie Babin with Imperial PFS, Brian Howard, Sharon Perschall Howard with State National Fire Insurance and Ann’Lee Earles with The Monson Law Firm.phoma) – 16 years old from St. Francisville wants to go to Ireland. If you would like to make a donation to the “Make A Wish” Foundation, you can do so at www.wish.org. Pictured are Matthew Monson, Esq., Baylie Babin with Imperial PFS, Brian Howard, Sharon Perschall Howard with State National Fire Insurance and Ann’Lee Earles with The Monson Law Firm. Click here to view pictures! The Monson Law Firm attended Emergency Restoration’s 5th Annual Customer Appreciation Social at Heritage Grill in Metairie. This year’s guest speaker was Brian Greffenius of Sandler Training. Brain spoke on the topic of how to give the “Best Customer Service Ever”. We were so excited to be Emergency Restoration’s door prize winners of a new stainless steel gas grill. Special thanks to Emergency Restoration for hosting such a great event! Pictured are Mike Orlando with Emergency Restoration, Inc., Ann’Lee Earles with The Monson Law Firm, Brittany Davis Stoudt with Emergency Restoration, Inc. and Matthew Monson. Click here to view pictures! 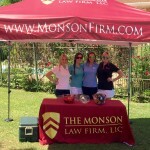 The Monson Law Firm sponsored a hole at the 13th Annual New Orleans Chapter of Professional Insurance Agents Charity Golf Tournament, which was held in Kenner at the Chateau Golf and Country Club. Funds raised at the annual golf tournament are given to the James C. Herndon Memorial Fund. 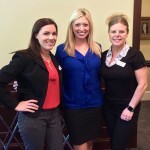 Pictured are Rachel Salter with Southern Fidelity Insurance Company, Allison Salter with Guarantee Restoration Services, LLC, Baylie Babin with Imperial PFS and Ann’Lee Earles with the Monson Law Firm. Click here to view pictures! The Monson Law Firm attended the North Shore Chapter of Professional Insurance Agent’s April lunch meeting at Keith Young’s in Madisonville. The topic of the meeting was on “Employment Law Concerns.” Pictured are Amanda Villemarette with LCI Workers’ Comp, Ann’Lee Earles, CPIA with The Monson Law Firm and Eugenie Babin with LCI Workers’ Comp. Click here to view pictures!